The likelihoods of facing intense competition on Amazon are high when you know that there are millions of sellers selling on Amazon with thousands in each product category. In the life of a wishful Amazon FBA seller in addition to a current seller, Amazon Product Research and determining the product to sell is the most stressful and overwhelming step. Scouring through hot items, bullets, images, listing, analyzing product criteria, competition and bestseller lists is maddening and time-consuming. Is there enough demand for the product I chose? Will I be able to sell it easily? Is the product seasonal? Will the product be good for the holiday season? What will be the refund/return rate? How much will it cost to ship? Do buyers expect it to work faultlessly for years? Would this require customer support? These are a few of the many questions every aspiring Amazon FBA seller asks him/herself while doing product research. In Amazon Product Research Tool, selecting the right product to sell is the most essential factor for success. However, you are not the only seller eyeing that particular product. Analyzing your competition is also a crucial part of your Amazon Product Research. How dominant is your competition? If you really want to perform well on the world’s biggest marketplace, the work you do before putting your product for sale is just as important as the quality of your product and how you market it. How much they are selling? What is their pricing strategy? What product variations are they offering (if any)? In this post, we are going to tell you some pointers about product selection and competition, that is, what should you look into when analyzing competitors on Amazon? Let’s break down a few points. To be honest, there is no one norm that applies to everything when it comes to evaluating the competition on Amazon. So much goes into determining what product should be tracked and which one seller/sellers should learn to avoid. The following red flags should be considered when analyzing the competition. Avoid competing with the products that show up on multiple pages and look exactly the same. In technical terms, these products are called ‘saturated products’ and will not allow your product to stand out. On the other hand, the listings will be similar to an extent that differentiating one from another will be difficult. There is no such thing as a ‘magic number’ of listings, which will boost your sales so avoid banking on it. The simple rule of ‘supply and demand’ is still the tried and true way of analyzing the market. Do proper research and balance the number of searches a month including different keywords and the number of sales for that particular product. Is there not enough customer searches and too much supply? Or is there more demand than there are supplier listings. If you are just starting on Amazon or are already an Amazon seller, still avoid bringing new products that aren’t anywhere in the Amazon catalog. Unless you are quite sure that it will sell, it is risky to bring in new products. You can use only a little research to measure sales. If you are launching a new product, you won’t be able to compare keywords that drive buyers to your listing. Moreover, you don’t have any comparisons for how products rank if yours is the only one. Strictly avoid competing with product listings that are optimized, have lots of awesome product reviews and great images. Competing with a dominant seller is a foolish move as he/she is already ruling that space with distinctive, well-thought-out listings, and hundreds of excellent reviews. By using the available Amazon tools for Amazon Product Research like Product Spy Pro, you can conduct a detailed comparative analysis between your FBA business and other competitors. The process is nothing but simply looking at some facts and figures. As an Amazon seller, it is vital for you to perform competitor breakdown so as to determine your product/niche advantage and make a profit. 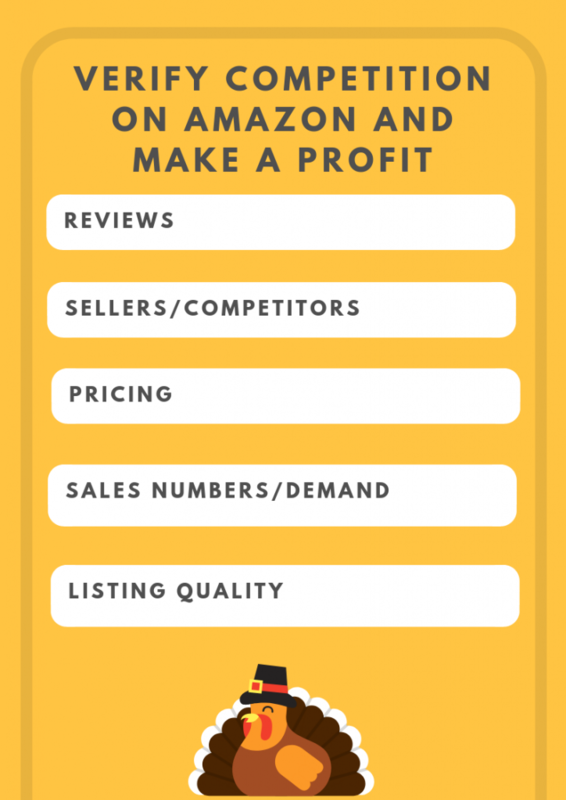 The following are some competitor analysis principles to consider while doing Amazon Product Research in order to make a profit. When it comes to competitor analysis, reviews offer a wealth of information. Competitors have a number of reviews and if you are targeting a particular product, look at the product page and determine how many reviews the top competitors have. The general rule of thumb states that if the top five sellers of the same niche/product each have more than 400 customer reviews, it is undoubtedly going to be a difficult for you to get the traction selling. It has the established set of Amazon sellers who are selling in the same niche in reasonable volumes for some time. It is not that you couldn’t do well, but it is not going to be an easy win to come by. Then again, if one or two of that top five sellers have less than 400 reviews, you could put yourself in the top five spots with a little bit of work. It is important to note that you should be aware of Amazon’s guidelines for soliciting of reviews. Moreover, the other thing reviews give is valuable buyer feedback. Go through the reviews and look for anything that jumps out from your competitor reviews that could easily be improved upon. There will surely be some comments that will give you a fair idea of what to avoid. When you are looking at the competitors themselves, you look for a couple of things. First and foremost, is Amazon selling the product itself? In most cases, it is challenging to compete with Amazon on a product they are selling. For starters, Amazon’s scale gives them access to much better pricing and hence they are more expectedly able to challenge other sellers. Therefore, we advise you to avoid choosing the products sold by Amazon directly. Secondly, determine how many sellers are there. Go to the product page to find out. Now, if there are many sellers selling the same product as you, it may be in your interest to best avoid it. Nevertheless, this is not essentially required if you can provide different benefits like ‘Prime’ eligibility. As you may know that there are millions of Amazon Prime members who mostly search the products based on their Prime eligibility, especially if they need it as quick as possible. Therefore, don’t overlook the draw that being Prime eligibility brings. Should you try to compete on the price of the product? It is a known fact that pricing has an impact on winning the Buy Box; however, is it convincing to think you can compete this way? For the time being, let’s say you have access to much better pricing on the products than your competitors, however, it is a low probability. It is Amazon we are talking about, if you are selling an imported product that others can get their hands on as well, the chances are anyone could be cutting the deals on price. So what are the ways to lower your costs? You can think of reducing the fees you pay! The charges are set by Amazon and can only be lowered so far, though others are trying to do the same thing. You can try to undercut on price, but according to experts and professionals, this is really a risky strategy. We recently did a study on two competitors who we noticed had recently started up shared many similarities with each other; however, there were differences as well. We concluded that competing on price simply wasn’t a great strategy as it would shrink the margins that eventually means selling the product was not worth the time. What’s the best strategy? For starters, compete on what makes you different. In the competitors’ case, one failed to thrive while the other succeeded. They sold the same product – bamboo sheets. The one who succeeded sold bamboo sheets that were stronger and wider. It was their competitive difference as you know everyone hates it when their bamboo sheets breaks off. So, when you are evaluating the competition, pricing does come into it but it is all about whether you can offer products that are similarly priced, yet can be distinguished by some means. You can track the pricing over time; it is a good approach towards competitor analysis. Sharp slopes happening constantly can indicate that competition is comprehensively based on pricing. This point by no means should be avoided. You always want to have a good measure of the demand for the product first. One easy way to determine the demand is to look at the Best Seller Rank. Higher the BSR, more units are being sold. However, how much does that really explain? Is the demand too high that you should be able to do well? You can avail the benefits of tools that can easily provide you with an easy estimate of the monthly sales numbers depending on your product. Now the next question is what numbers you should be looking for regarding sales velocity. It is the decision that only you can make, considering the information you have on your competitors and the product you are selling. If it is a seasonal product, you can assume selling in low numbers until the season arrives. Apart from sales numbers and demand, you should also look into sales trends. Determine the trend line and what does it depict. Products showing sales deteriorating over time should be steered clear off. On the other hand, those that show consistence increase or are steady might be good choices. Remember that if the sales numbers are of very low volume and you are confident about doing better than your competitors do with some minor tweaks, then you should go for it. The quality of the listing is one major area where you might be able to compete without any hassle. This includes descriptions and keyword usage. These are something that you can easily improve upon, giving an edge over the competitors. By doing this, you are looking for weaknesses of the sellers and competitors, which you will be able to do better in. For instance, when bullet points or descriptions are least, there are other things you can add like the benefits of the product or use of the product, anything that hasn’t been discussed. This brings in the possibility of inserting more keywords in your listing allowing you to draw more crowds of buyers. Conducting some basic competitor research is very crucial if you want to increase your odds of effectively adding best products to private label on amazon. Look for the signs that suggest this particular product with demand from competitors and buyers who can sensibly do well against. Always looking for the sweet spot of high demand versus low competition is not recommended. Instead, look for aspects like optimization of listings, sales velocity, quality, and reviews. This will probably help you lay down a new level of competition.